The TR-909's clap featured one control the user could adjust: volume. That was not okay with us. I'm a huge fan of house music. I love the 909 clap. So this is a module I agonised over features I wanted it to have for a long time. And here it is. I hope you find it as useful as I do! 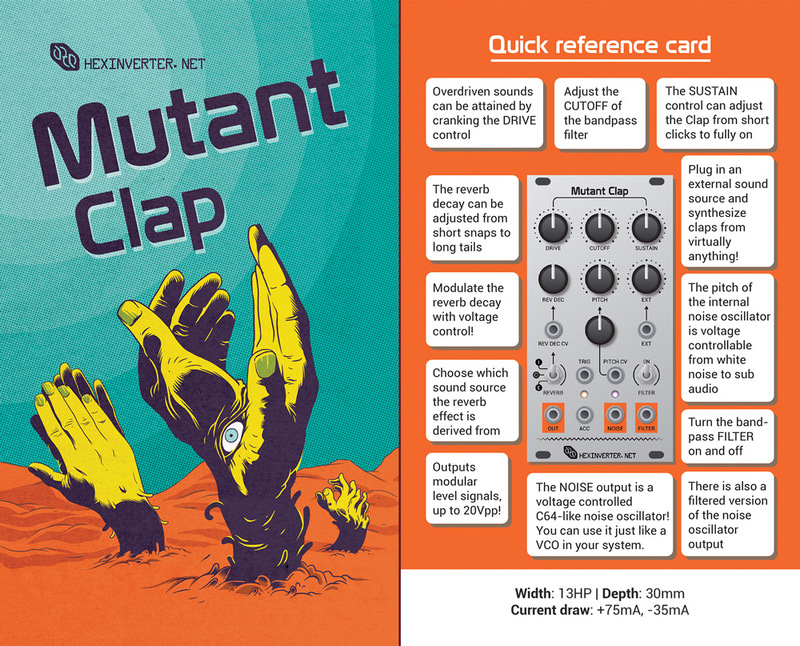 Just like the other Mutant Drums, the Clap is a highly versatile module. It is actually a voltage controlled LFSR noise oscillator as well as a powerful percussion synthesis engine! SUSTAIN control lets you crank up the clap's sustain and use the module as an abstract synth voice with external inputs! Reverb decay forms the decay of the clap sound, and is fully voltage controllable from short reverb "snaps" to long, whooshing tails!